Photographs of Boston Harbor Marina seven miles north of Olympia, Washington; American Wigeon; Sunset over marina and Purple Sea Star. NEW! Really great video of Plankton along with a video of habitats and inhabitants of Tolmie State Park. Videos of Giant Barnacles, Blue Striped Surfperch, Pacific Sand Lance, Shiner Perch, Red Rock Crab, Boston Harbor Marina piling animals, Sunflower sea star and marine worm homes filmed by diver Phil Sconce. This is a journey through the easily accessible major marine habitats and their associated organisms that are found in Puget Sound, a large estuary (or a place where fresh and saltwater mix) in the western part of the State of Washington, U.S.A. It is based, in part, on a series of weekly articles with photographs produced by the Author for the local newspaper, The Olympian, from May of 2006 to November, 2008. Information about local public sites in Thurston County, Washington providing access to marine habitats and associated organisms can be found on the Local Public Access page. HABITATS: The habitats range from intertidal beaches and the nearby open water to the piling and floats of local marinas. The subtidal zone which requires specialized equipment to explore is not covered. The physical characteristics and common animals and plants associated with each habitat are described in the Marine Habitat Section. Pacific Coast marine ecology dates from the work by Ed Ricketts in the 1930’s. A summary of that history can be found at the Marine Biology History Page. ORGANISM INFORMATION: If you want more information about a particular animal or plant go directly to the Marine Plants and Animals List, then click on the organism of interest. Only selected organisms that are easily seen are included. Many other species are also present in each habitat. They are identified in some of the marine beach guide books discussed at the bottom of the Marine Biology History Page. All of the organisms are related as illustrated by the “Tree of Life” which is a chart of the evolution from primitive single cells to complex multicellular organisms. ORGANISM IDENTIFICATION: If you are NOT sure about the name of a plant or animal you have found on a beach walk go to the Marine Plants and Animals List and click on the name of a major group that you think the organism belongs to. A series of photographs of the organisms that belong to that group will appear. You can use the photographs to identify the organism in question. PUGET SOUND is a large inland estuary connected to the Pacific Ocean. It is about 95 miles long and 1 to 5 miles wide with it’s northern boundary at Admiralty Inlet and ending in the south at the city of Olympia. The shoreline is 1330 miles long, of that some 30% is armored with bulkheads. The average depth is around 450 feet with a maximum depth of around 930 ft. It is subdivided into three deep basins connected by shallow sills, Whidbey Basin (mean depth-206’), South Sound (mean depth-121’) and the Main Basin (mean depth-323’). An associated body of water located to the west of Puget Sound is Hood Canal which is about 50 miles long and 1 mile wide. 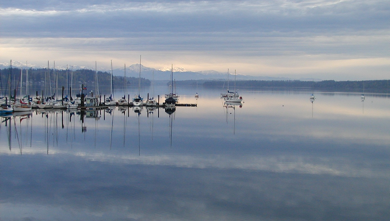 The average depth of Hood Canal is 177 ft. with a maximum of 600 ft. in Dabob Bay. Puget Sound connects with the Pacific Ocean through the Strait of Juan de Fuca to the west and Georgia Strait to the north. 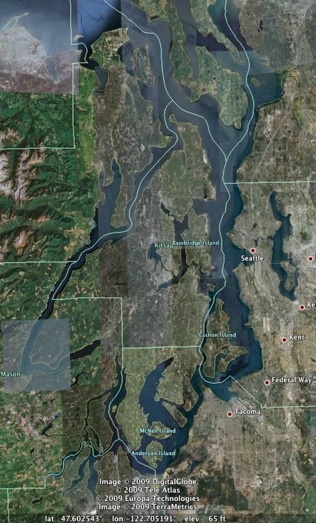 Puget Sound and the associated low lands found their origin in the advance of western lobes of a continental glacier which ended around ten thousand years ago. For more information go to the page on the Formation of Puget Sound. Around it’s shores live some 4 million people with the largest cities being Seattle, Tacoma, Everett, Olympia and Bremerton. This is a major cause of the increase in pollution in Puget Sound. Go to the Pollution page for more information. All materials on this web site including all photographs are property of David W Jamison (unless otherwise indicated) and may not be used in any form without permission. Do you like feeding fish? 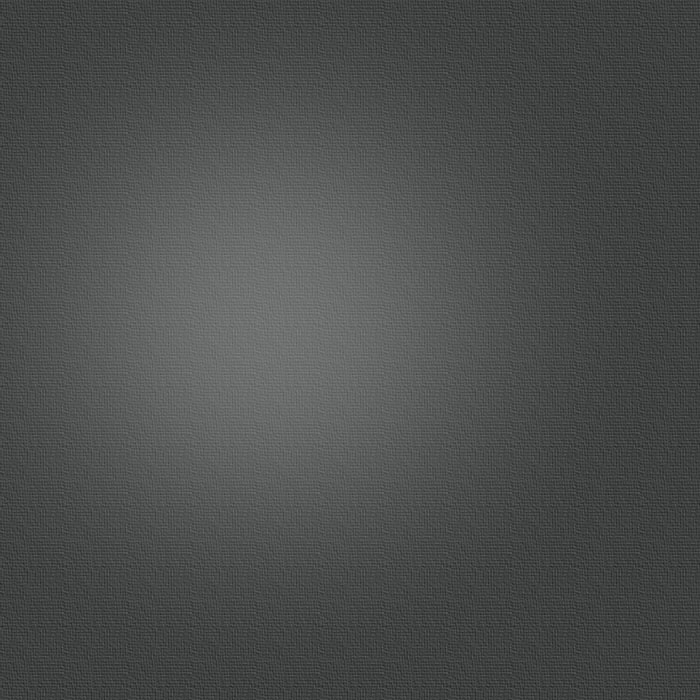 Just put your pointer arrow in the below box and double click to put food in the water.